Yesterday, I wrote about why I keep buying tickets for Spider-Man movies even though I suffer from a near-perpetual case of superhero burnout. That was all preface for this: a few words about Spider-Man: Homecoming. I wasn’t one for parades when I was a kid. As an introvert, I was not drawn to the crowds, to the noise, to the long day of sitting and watching. As the son of health-conscious, budget-conscious parents, I didn’t want a day of seeing neon-colored cotton candy I couldn’t eat, or souvenirs I couldn’t have. I would rather have stayed home where I could be active in making stuff rather than just playing bystander. But my parents inspired my interest in the Portland Rose Festival Parade by pointing out that Spider-Man would make an appearance. And so unfolded an episode of family history in which I reportedly felt betrayed by his failure to show up as scheduled. I sulked and complained until, at the very end of the parade, a tow truck played the part of caboose, hauling Spidey’s broken float. And there he was, waving — somewhat sheepishly, I remember — to the viewers who were still paying attention. I think I felt embarrassed for him. He should have been the parade’s main event. He should have driven the crowds mad, instead of, well, being driven. That’s how I’ve felt about several of the Spider-Man big-screen movies: They’ve rarely come anywhere close to the quality of the visions in my own imagination. They’ve seemed like huge, noisy, blustery, bombastic vehicles in which we who grew up reading dime-store comics and watching The Electric Company catch glimpses of the webslinger that we love. 2002’s Spider-Man starred Tobey Maguire and Kirsten Dunst. The first feature-length Spider-Man, the opener of Sam Raimi’s trilogy, found a winning Peter Parker in Tobey Maguire (even if he had already played a college student for Ang Lee five years earlier), a note-perfect J. Jonah Jameson in J.K. Simmons, and a perfectly heart-throbbish MJ in Kirsten Dunst. But once the film bypassed the scenes of Parker’s giddy realizations about his superpowers, and we moved into the his primary conflict with the Green Goblin (Willem Dafoe, giddily wicked), who bore a strange resemblance to the similarly split personality of Smeagol/Gollum in The Lord of the Rings: The Two Towers, things began to feel strained. And the CGI action only emphasized our hero’s artificiality. He lacked weight. When the storylines finally converged, they delivered an anticlimactic resolution that, like Christopher Nolan’s Batman Begins, called its hero “heroic” for refusing to kill the bad guy even as the audience was still treated to the gratifying sight of the villain’s own deadly machinery turning and skewering him. Ugh. Spider-Man 2 came to the rescue, becoming the movie I’d wanted to see since childhood. It tapped into my own wild imaginings of what the real Spidey would look like in action. Since its arrival, it’s been the only movie that beats with a Spider-Man heart, drawing me back again and again. In Spider-Man 2, fans finally got the movie they‘d been dreaming about. When I talk to my film students about the art of great action scenes, I point to its thrilling elevated train sequence which combines a showdown with Doc Ock (Alfred Molina at the peak of his powers) with a desperate attempt to save a bunch of screaming passengers. In doing so — if you think I’m exaggerating, just watch the scene — he becomes, through his web-slinging frenzy an imitation of Christ, his sufferings spelling out Stations of the Cross (right down to the cruciform pose, the bloody wound in his side, a sort of “death scene” in which awestruck and heartbroken onlookers realize who he “really is” … and then, a rising again. Raimi’s third film built on the success of the second, and I was delighted to find Raimi trying out some wildly audacious ideas — particularly a musical sequence that unleashed Parker’s dark side. But it was burdened by typical sequel-itis, overstuffed with anemic storylines, forgettable villains, and, well… James Franco. Director Marc Webb (it’s still hard to believe, isn’t it?) spun a reboot — one that was necessary, with Maguire now in his 30s — and his choices for Parker and MJ had their strong points: the athletic Andrew Garfield and wide-eyed Emma Stone had obvious (and true-to-life) chemistry. But they didn’t look like high schoolers, and we couldn’t escape a sense of “too soon,” “too familiar,” and “too automatic.” Perhaps the pressure and the poor reviews were what hollowed out Garfield’s features enough to win him the lead role in Scorsese’s Silence. By contrast, director Jon Watts’ boldly inventive Spider-man: Homecoming feels fresh, inspired, and consistently surprising. Surprise Number One? It’s amazing how Watts — whose previous feature film, a tightly wound thriller called Cop Car, demonstrated how much he can do with very, very little — could leap with such confidence to such a large scale project. He makes it look even easier than Spider-Man bounding up the side of the Washington Monument. Surprise Number Two? Homecoming was written by six screenwriters — usually a promise that the film will be uneven and probably awful. It isn’t. The writing feels focused, refined, and alive with an eagerness to fulfill every Spider-Fan’s dreams. It’s really good. I love how Homecoming‘s writers zoom in and find a story happening almost entirely within a small neighborhood, one likely overlooked by the Avengers as they bound around the globe. In fact, they find the story in the debris of the Avengers’ recklessness, the very rubble that troubles me so much when superhero movies leave it unexamined and unswept, its cost uncalculated. 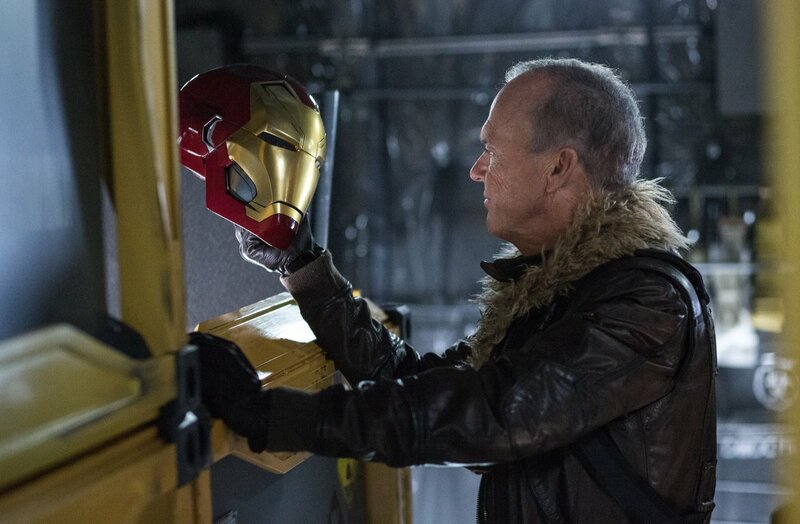 The origin story of this young Spidey’s first big nemesis begins in the heart of somebody dealing with all of that debris — a clean-up crew and salvage foreman, Adrian Toomes (Michael Keaton), who finds treasure in the garbage, and who decides to do something with it when his experience of the Marvel Universe is minimized and dismissed. Keaton — insert Birdman jokes here — plays Toomes as a justifiably frustrated businessman who just wants to be treated fairly. When he’s pushed too far, he’s becomes a high-tech version of Michael Douglas in Falling Down, ready to unleash hell in order to get noticed. That is good storytelling. Go team! Surprise Number Three? The Michael Keaton I loved in the ’80s — the one who brought such wickedly entertaining energy to Beetlejuice — is back! It was good to see him as a resilient real-news American hero in Spotlight, but I’ve missed the maniac I once loved in Tim Burton’s early work. Keaton’s fantastic here, evolving from temperamental to, well, absolutely mental. Surprise Number Four? Tom Holland. He’s not just another Peter Parker: He combines Maguire’s knack for wide-eyed exasperation, Garfield’s athleticism and grace, and characteristics that I suspect are inspired by the best boy-heroes of the 1980s (especially the stammering Michael J. Fox, the mischievous Matthew Broderick, and the earnest Sean Astin). Best of all, I can believe that Holland is in high school. Here’s hoping that Holland, 20, can preserve that kid-like spark for a few more movies. Perhaps the biggest surprise is just how consistently Watts and Company go on surprising us, all the way to the end-credits “stinger” that earns what may be the biggest post-credits laugh ever achieved. The movie flows effortlessly, scene by scene, from Parker’s practice-run crime fighting into his unexpected entanglement in high-stakes villainy, led by The Vulture. The movie prolongs their separate storylines, increasing our concern about how and when they will finally face one another in a showdown. The turn that brings them together, eye-to-eye, exposed, comes like a gut punch. It may smack of the “It’s a Small World” Syndrome that weakens franchises, but it’s still a zinger of a surprise. The movie has a disappointing dearth of Marisa Tomei. Captain America: Civil War teased us with the revelation that Tomei would play an Aunt May young enough to be a love interest for Tony Stark. Here, she doesn’t have time to play much more than a threat to Parker’s secrecy. 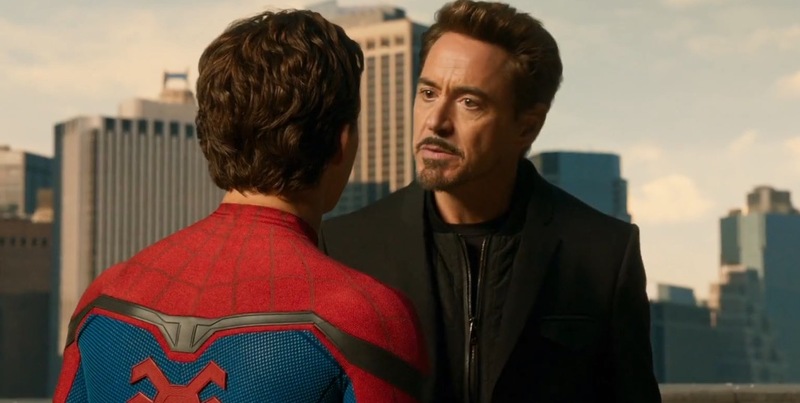 And speaking of Stark: Much has been written about the irony of Tony Stark — who has shown himself to be spectacularly immature, reckless, and irresponsible — becoming a mentor to Parker, trying to impress upon him his need to start small, be responsible, and grow into his role as a superhero. Yeah, that doesn’t work for me either. While Spider-Man: Homecoming is supposed to establish the webslinger as a force to be reckoned with in the world of the Avengers, it also ends up accentuating just what poor role models those Dream Team players really are. And that’s an unexpected blessing, whether the filmmakers realize it or not. In a film that seems to be the film about Parker proving himself and earning his way onto the Avengers’ team, we end up questioning such ambitions — in fact, it might give thoughtful moviegoers pause when the next Avengers-focused epic comes around, causing us to ask if there might not be more cons to having Avengers around than pros. But these flaws are small enough to make me think that Spider-Man has finally found some big-screen storytellers worthy of his promise. The only deeply disappointing move they make is probably one that all Marvel storytellers are contract-bound to deliver: a showdown sequence so saturated with CGI, so contrary to the laws of physics, so full of unnecessary sound and fury that it feels for a few moments like it belongs in another movie. Why do Spidey and Vulture have to have a fight on an airplane? And I do mean on — not inside — an airplane? Why do they have to invest 10–15 minutes in a climactic showdown at all? Why not imagine something new? In both Wonder Woman and Spider-man: Homecoming, the movies’ strengths — their chemistry sets of likable personalities — make the finales feel like a letdown, sequences that, if I were watching them at home, I would fast-forward through. Having said that, I felt a surge of relief as the struggle resolved. It’s a surprising variation. I won’t spoil it. Suffice it to say that you shouldn’t let that triumphant music play out without realizing the nature of Peter Parker’s triumph. What choices does he make here? How does that stand in stark contrast to so many other superhero movie conclusions — including those that focus on this character? So, while I’d argue that Spider-man 2 still stands at the top of the list as the only manifestation that truly touches transcendence, giving Spidey a mythic quality that resonates with genuinely religious implications, Spider-man: Homecoming touches greatness too. Watts and Company give us a new Parker and a new Spider-man entirely sufficient to the task of course-correcting and extending the webslinger’s adventures on the big screen, emphasizing Spider-Man’s inclination to save rather than win, to show mercy rather than superiority. And the movie touches greatness in another way too, one that might be more timely and important. As I write this, there are white supremacists marching on the campus of the University of Virginia in Charlottesville. They are raising their hands in Nazi salutes. And our President is refusing to oppose them — which means, of course, that he is breaking from a national tradition of opposing Nazism, which emboldens Nazis. In fact, he is equating those who oppose racism with hate movements. He is the President of White Supremacy. So I’m not going to miss an opportunity to say how much I love the way Spider-Man: Homecoming tells the truth about the reality of multicultural high school communities without serving up any self-congratulatory gestures. When we see Parker with his friends, he’s fits into a wide-ranging spectrum of colors, cultures, and personalities. His best friend Ned, who dreams of being the “chair guy” who runs Spider-Man’s control center, is played by Hawaiian actor Jacob Batalon. And Michelle, a tough-talking member of Parker’s debate team, looks like she could become a gutsy superhero too, if she just had the right costume. 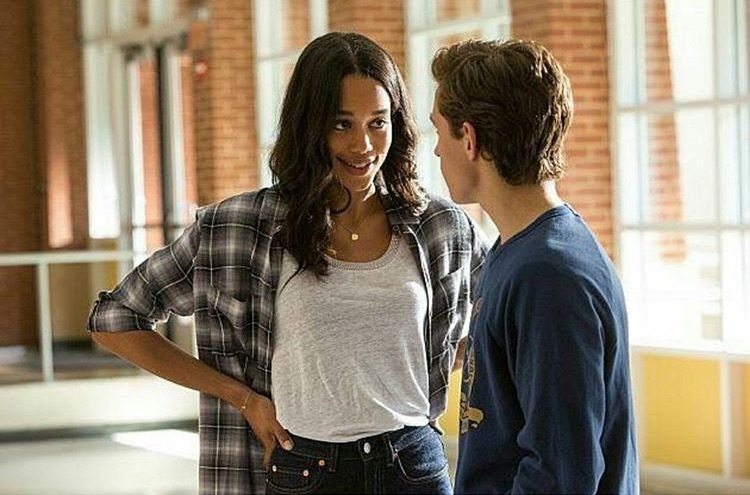 But Parker’s crushing on Liz (Laura Harrier) here — not a white, red-haired Mary Jane. And nobody comments on Liz’s blackness, her braininess, or the fact that she’s significantly taller than him. Now that’s progress, America. That turns a movie about a heroic Spider-Man into a heroic Spider-Man movie. And if you told me that this Spider-Man was coming to town, I’d say he deserves a parade. Not only is Liz’s blackness not mentioned, it turns out to be cool plot device when Peter meets her dad.